I was in line at the bank yesterday. The man in front of me walked up to the counter, plunked down a wad of $50 bills, and said to the teller, "Can I get change for these bills? I'd like it all in gold-colored coins - Sacagawea dollar coins, please." "Do they all have to be Sacagaweas?" asked the teller, opening her drawer. "I might not have enough. I have some American Silver Eagle dollar coins, the silver-colored ones. Are those ok?" "No," said the man decisively. "They have to be gold-colored. 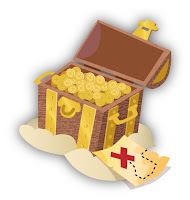 I have a wooden chest at home, and I want to fill it with gold-looking coins so when people come over, it looks like I have a chest full of treasure." A childhood friend was visiting New York earlier this week, so we met for lunch on Wednesday. This friend grew up with me in the Deep South, and has been living in New Orleans for her entire adult life. Wednesday, the day we met for lunch, also happened to be St. Patrick's Day. As many people know, the St. Patrick's Day parade in New York City is the biggest in the world. This friend was staying in a hotel just off Fifth Avenue, so she watched it during her stay. When we met, she kept talking about how strange the parade was. "How is it strange?" I asked. "Well," she said. "It's pretty clean and orderly. I noticed people aren't allowed to drink while they watch the parade. And does everyone in the parade just walk down the street?" "Yeah, they walk," I responded. "How else would they march in the parade?" "You mean nobody rides in floats?" she asked, incredulously. "And they don't throw anything to the spectators? Why earth would anybody want to go to a parade where nobody is throwing anything?" I've had a bad cold for the past week. Nothing has helped me get over this bad cough, sore throat and congestion. Nothing - not even taking a day off from work last week. Not medication or lots of fluids. Not even going to bed early every night and avoiding going outside. Nothing, that is, until tonight, when the Husband and I went to see the Allman Brothers Band perform in concert. Sitting in our seats, the Husband and I realized that: (1) we were the only Asians in the audience; and (2) we were surrounded by aging baby boomers, all toking up. Seriously, they were handing around lit joints and blowing smoke rings at the ceiling. So I'm a goody-goody. I always obey traffic rules, I'm always honest with my taxes, and I've never done any sort of illegal drug. Partly because I never really had the opportunity as a kid, and mostly because they're illegal. And the thought of doing anything illegal always gets me nervous. I've just never gone there. Additionally, apart from the marijuana issue, it's also illegal to smoke in a building in New York City. The odd thing was, when we left, I realized that my sinuses seemed to have cleared. Over the weekend the Husband and I took a taxi across town to visit some friends. We unfortunately got the world's worst taxi driver. He was surly and rude. When I said pleasantly, "Hello, how are you doing today?" he pointedly ignored me. When the street he was going to take across Central Park was blocked, he turned and went 20 blocks out of his way without a word. When I tried to tell him about an alternate route he yelled, "I know, I know! Ok, ok!" and cut me off with a wave of his hand. He drove about twice the speed limit. He cut off several cars, and when the driver of one gave him a shocked look and shook his head, our guy rolled down his window and gave him the finger. As we were nearing our destination, the taxi suddenly began to lurch, then started to bump. The taxi driver grunted in frustration. We took the opportunity to say brightly, "Ok, we can just jump out here!" Then we hurriedly paid him and got out of the taxi, relieved to get away. Out of plain meanness or stubbornness, he refused to stop to check it. The last we saw him, he was still bumping down Fifth Avenue, riding the rim of his flat tire and turning the corner. I wanted to call the NY City Taxi and Limousine Commission to report him, but the Husband convinced me not to. "He's already having a bad day," he explained. "And this is what he gets for being mean and nasty." I admit I was a little delighted in the karmic justice of it all. Sir Mix-a-Lot Sorry I've been such a truant lately about posting! Where do the weeks go? I was cleaning out my closet this weekend, and I finally got rid of some old mix tapes I'd had since junior high. Do you guys remember those? I used to be the queen of mix tapes in the late 80s to early 90s. This was back before cars had cd players. So most of my friends had cds, but we would transfer our favorite songs to cassette tapes so we could listen to them anytime we wanted. It was especially cool if you had a Walkman, or a tape player in your car. You were totally rad! We didn't have portable cd players, or mp3s, or iTunes. 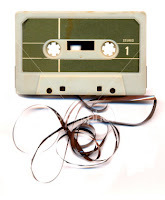 If you didn't like a song on a tape, you had to fast forward through it! And if you liked a song a lot, you couldn't just hit the "Repeat" button. You had to rewind! We made mix tapes for all occasions. I remember getting a couple from my friends for my 13th birthday. A boy who liked me in high school made me a mix tape, full of romantic songs. Another boy I rejected made me a mix tape, full of sad and angsty songs. When my grandfather died and my dad had to fly back to Asia for his funeral, I made him a mix tape full of his favorite show tunes and Carpenters songs, to listen to on the long and lonely plane ride. When I went on a road trip with my college roommates, we made several mix tapes in anticipation of the trip. There are certain songs from the mid 90s that evoke memories of those trip, when I hear them on the radio now. This weekend I dug out those old tapes, marked with that strip of paper with my childish handwriting on them, with labels like Spring Break '97 and THB's Summer Mix 1988. They were covered in dust and unplayable now (since I don't even have a cassette player in my home anymore), I did feel a small sense of loss. Thankfully, I can just download those songs off the Internet! But after I play them, they disappear into nothing. As opposed to these creaky old tapes that stack up and gather dust and occupy space in more than just my memory.